The closest my high school experience came to this Swine Flu thing was senior year when some kid wrote a bomb threat on the wall of one of the stalls next to the photo lab. It wasn’t too long after Columbine, and on that particular day, attendance at our school was less than half (This was particularly sad because they showed Dustin’s EMP project on the school’s morning news show that day, and lots of people weren’t there to see it.). In any case, that was what I was expecting this morning. I admit, I’ve been looking forward to taking this week off. Last week was the first week in a long time that we had 5 straight days of school, and with 5 weeks left until the next term break, I’m ready to cut out early. So when my pule announced government schools were closed this week, I was sure we’d be closed too. After all, parliament recommended all schools close. And how could the Congregationalist schools heartlessly force students to show up today? But my neighbor Maengi, who has a TV, told me last night that school was indeed on for today. I couldn’t find it in myself to do much preparing last night. No one else has to go to school. The Catholics are off, government schools are off, even the Methodists extended the break to last the whole week. Why would my students show up? Since I live on campus, and since I am notorious for waiting until the very last minute to get out of bed, I can usually hear the murmur of students on campus the moment I wake up. This morning I sat up and rubbed my eyes and tried to listen. Were they here? Couldn’t be. Today would be a ghost town. Right? I buckled my ’ie and grabbed my phone and keys (I forgot my USB drive this morning. Always a lousy omen when that happens.). I brushed my teeth and walked outside. They were all there. Milling about on the stairs, the balcony, the lawn. Dammit. 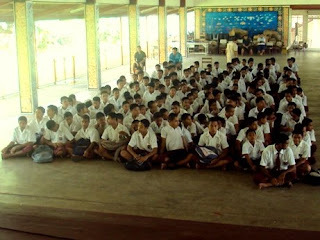 We had our regular Monday morning assembly and walking in, the boys’ side of the hall looked smaller, but the girls had shown up in droves. 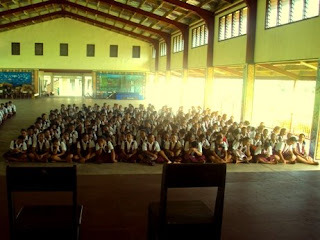 And as the assembly went on, more kept showing up. As it turned out, in many classes today, I had students than usual. Here I was, ready to forfeit my curriculum for the week, ready to reward those who actually showed up with extra computer time, ready to lay back and have a little teacher malōlō. Not today. With fearless immune systems, my kids laughed in the face of Swine Flu. 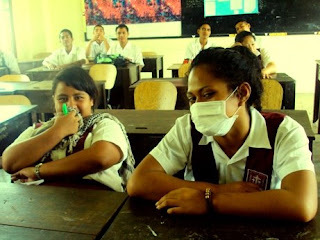 When I showed up to the 11.1 class after Interval, Joanna was sitting in the front row, looking up at me diligently—wearing a surgical mask. I tried to look away, but I couldn’t help it. I started laughing. And she started laughing. And the class started laughing. Glad we’re all on the same page about the ma’i pua’a scare. I hope you’re taking your own hypoallergenic precautions. Pictures below. The girls had a strong showing this morning. 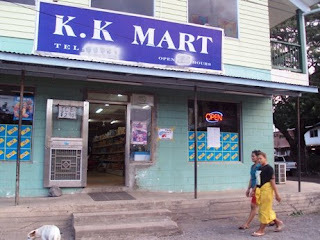 K.K Mart near the Peace Corps office. 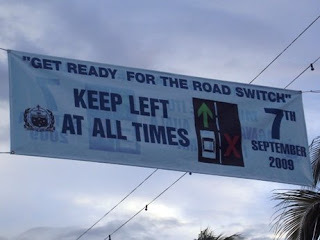 I didn't realize the English translation of the sign that topped yesterday's post was just on the other side of the sign. They all showed up!! Too funny! Love the mask. Swine flu got everyone scared where I live - everyone nuts about getting the vaccine - and you were nuts if you choose not to get it...like me. I appreciated everyone being extra vigilant about keeping their kids home from school if they were sick or the schools actually sending kids home if they were sick. My kids had a very healthy school year this year compared to other years!